This comic went through a few different iterations before we decided on the best, each one of them featuring a sad Locke. Poor guy. 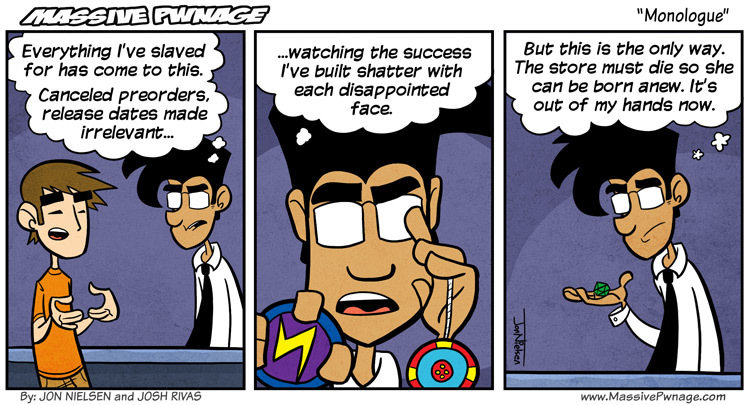 This entry was posted on Monday, November 15th, 2010 at 12:00 am and is filed under Comics. You can follow any responses to this entry through the RSS 2.0 feed. Both comments and pings are currently closed. Wait! WHAT DID HE ROLL?! Great comic as usual guys and I love my book of Pwnage and will cherish it forever! I think the thing that makes the whole book for me is the sketch of Imp with that afro. I’ve started rolling a D20 before every match in LoL. The D20 knows all, but it isn’t always honest with me.